Kendall Paige was finally born. She is 7.1 oz and as sweet as can be. Kendall has been snuggling and trying to make eye contact with me and she is a very concerned baby. She does everything she can to connect with me eye-wise. 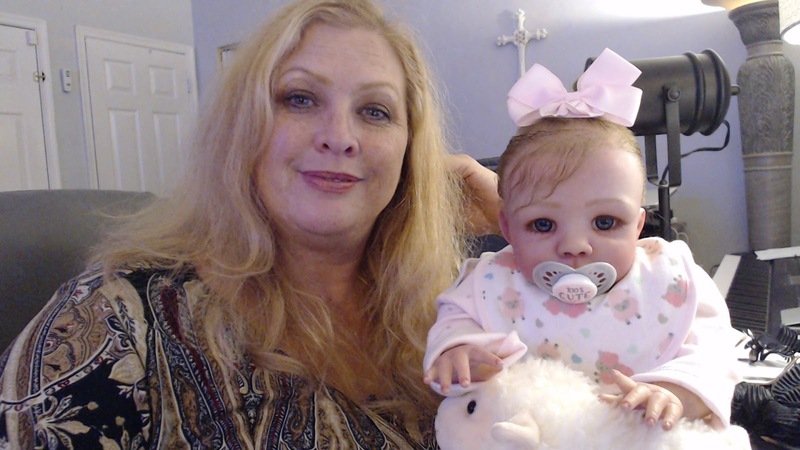 She is a doll baby and she is going to make some new Mommy or Daddy very happy! Kendall Paige is available. If you want her she is available without a belly or back plate for $350.00 plus shipping. She comes with a faux fur rosette blanket, a receiving blanket, a pajama (shown), a onesie with matching hat, extra diapers, organza ruffle socks, bunny slippers, large pink clip bow, pacifier, and bottle. She has magnets in her lips only for her pacifier. Paypal payment is $350 USD plus $59.95 for shipping. Please contact me if you are interested at snugglebabiesnursery@gmail.com. She will also be listed on alternative sites so if you want her let me know quickly. If you are outside the continental US and you want a quote on shipping just email me at snugglebabiesnursery@gmail.com.